It seems that every man and his dog… except Barnaby Joyce… happily takes for granted the popular claim that Australia’s sovereign debt levels are nothing to worry about. But have you ever stopped to think about whether we really can pay back the debt? I made the chart above using the data from the Government’s Mid-Year Economic and Fiscal Outlook (MYEFO) 2009-10 Budget statements. 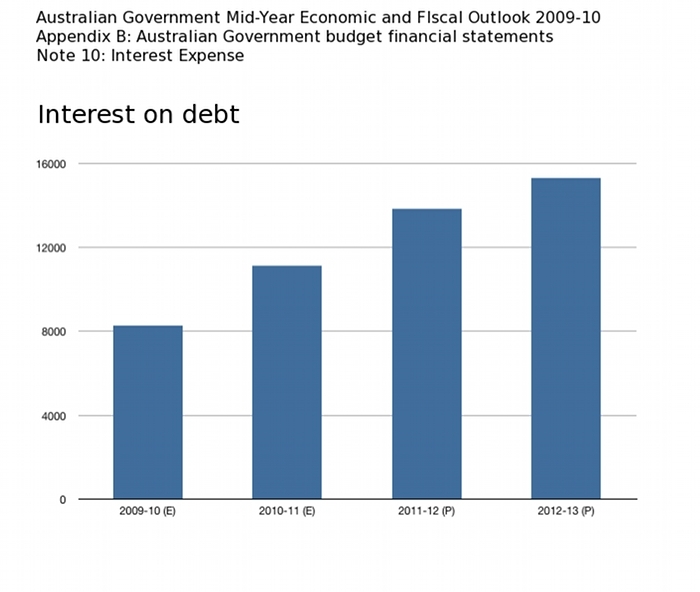 It shows Treasury Secretary Ken Henry’s projected Interest on debt for this financial year, and the following three years. Those are interest-only (not principal) repayments that Kevin Rudd incurred, and now we-the-taxpayers have to pay. Doesn’t look too bad, you say? An Interest bill starting at $8.26 Billion for 2009-10, rising to $15.28 Billion for 2012-13? Surely your $900 “bonus” cheque, and your dodgy roof insulation from the Fairy Ruddfather, make paying this Interest bill worthwhile? A mere $48.49 Billion in Interest-only to 2013, with more to follow? As you can see, Ken Henry’s projected Interest on debt alone is greater than many of the 12 years of Howard Government surpluses. And they came during an unprecedented mining boom. One other thing. Can anyone really believe Ken Henry’s projections? This is a man who could not see the GFC coming. And even now, he is confidently predicting a “Golden Age” of “unprecedented prosperity” for Australia, one that could “stretch to 2050”. All thanks to his belief in a 4o year continuous boom in China. He is clearly ignorant of the fact that more and more leading international economists… including some who did predict the GFC… are now predicting that China is a bubble that will bust within ten years. Paying back the projected Interest-only will obviously be a big challenge. So try to imagine how we are ever going to pay back the principal too. Barnaby Joyce has recently stated that it would take eight (8) consecutive years of $19 Billion surpluses to bring the budget back to earth. 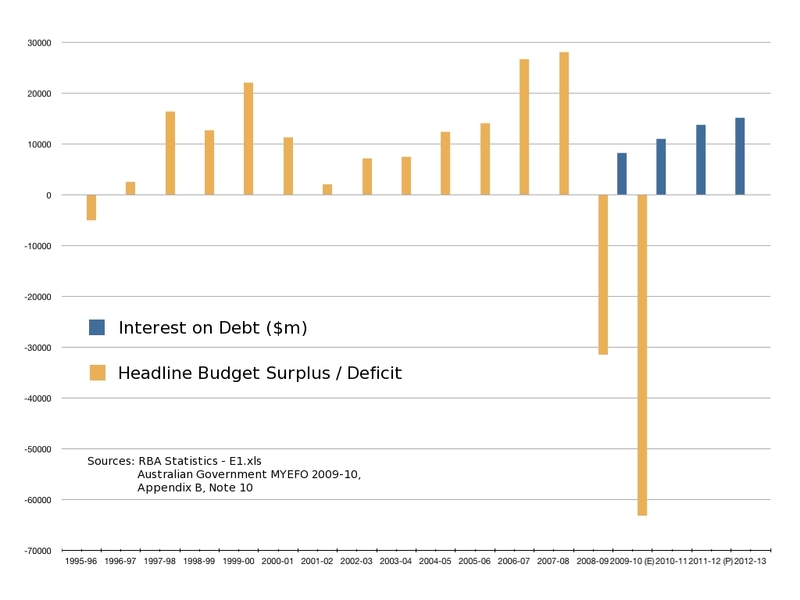 As you can see from the chart above, the Howard Government achieved a budget surplus that big only 3 times… in 12 years. It is easy to see why Barnaby is so concerned about our ever-rising debt under Rudd Labor. Because quite simply, we can not pay it back. Howard has 9 in 11 years. Left $22 billion in the reserve and a total of $88 billion in assets.Labor created this mountain. The Libs have to fix it.